Things are looking up! Back and forth to work today, which is 30 miles on the Interstate, which has an 80mph speed limit. Car is running great, for the most part. Got the brakes all taken care of, alignment seems quite good, so I'm pretty happy with how things are. Of course I still need to get the final version strut mounts so I can get the full range of camber adjustment, and proper brakeline mounts. I do have the brake lines secured, just not as factory, and I do want to get them put 'correct'. First autocross is Saturday. Wish me luck! Now, here's a very odd situation that just popped up for me, due to changes in NASA classification rules. They dropped the autocross classification set, and are using the TT classifications for autocross now. My potential problem is that TT classifications include aerodynamics. If a rear spoiler was part of the base model, I'm fine. If it was an option, it's worth +4 points. +4 points put me into the next higher class, which is where most modified Miata's live. Autocross isn't the main purpose for the car but I would still like to see how I can do in the seasonal points chase. For '88, was the spoiler still an option, or was it standard equipment at that point? And even more important, how do I prove it without the original window sticker? OK, I've decided I just don't care about points when it comes to the spoiler. If it puts me into NXE instead of NXF, and I have to face off against a bunch of Miata's, then so be it. 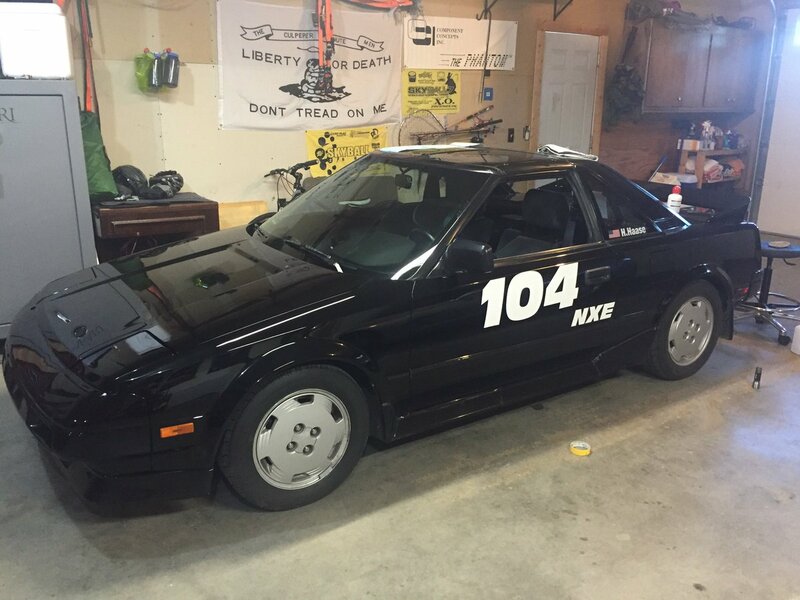 I'm building this car to run a completely different event, not as a dedicated autocross car. Besides, I'm going to be potentially running against cars a hell of a lot more potent than Mazda roadsters. 911's, Diablo's, NSX's, all theoretical potential opponents. So I probably should be looking to run against tougher competitors right from the start. For instance, let's look at #1 on this list, which ran this year in the same group I'm going to be in. Hint ... it's the 280z with the 350 running on giggle gas. That 280 was damn quick and sounded spectacular. One Lap is a bazooka fight, so even prepping a gun isn't enough. Make it through your first year reliably and then work on fast. Interesting. My gut tells me it was an option. I know it was a standard item on the SC version I had but all SCs were pretty loaded with t-top being standard also. I think it remained optional on the NA version. As for proof, see if you can find a copy of a '88 window sticker online. If not a window sticker, see if you can find an '88 brochure which might list what the options are. The history of the spoiler. '85: the spoiler had no brake light. '86: center mounted brake light became law and if you got a spoiler then a square light was added under the spoiler for a brake light. '89: for this one year only, the brake light became LED lights and the brake light itself was integrated into the curve of the spoiler. Going back to '86. If the spoiler was an option in '86 then I seem to remember there was a window mounted center brake light. I seem to remember that it would have been at the bottom of the rear window. Following this logic, there may be two bulb part numbers for the rear center brake given that there were two different bulb location options. I also looked at '89 on rockauto and it still just lists part # 1156. This seems odd because the spoiler version was now LED but all it shows is a traditional bulb (or the modern LED equivalent of that traditional bulb) but no other part number for the tiny spoiler mounted LEDs. Notice in this picture that it does not have a rear spoiler but it does have a center brake light in the rear window. The presence of the factory window mounted brake light is proof to me that this car left the factory without a spoiler. If that is possible then the spoiler was optional. Like this ad shows, in '88 there was a real base model that came without alloys (steel rims and trim rings ala Corolla) and a tweed cloth fabric, not velour like the next model up or the SC. Even leather was an option on SCs. Mine had velour. The spoiler unbolts from the deck lid which will leave you with 5 holes to fill but you can remove the spoiler. 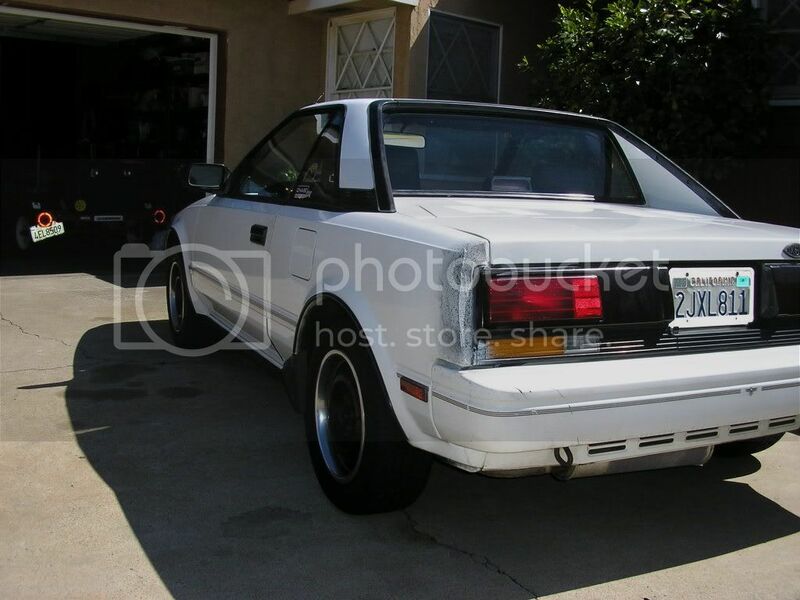 I still have a MR2 rear decklid but the one I have has is an '89 with the LED spoiler still mounted to it. That car looks like it has taken a rear end hit at some point. I wouldn't say that is evidence of the rear spoiler being optional, though I have seen cars without one. I have seen many many cars from the 80's and 90's with both spoiler- and window-mounted third brake lights. jfryjfry wrote: I have seen many many cars from the 80's and 90's with both spoiler- and window-mounted third brake lights. That is true if the spoiler was added after the factory, like a dealer added option. Not the case here. If it left the factory w/o a spoiler then it got a window brake light. Read the thread about the white MR2. The seller comments on it being a factory version with no spoiler. Found a scan of an original Toyota sales brochure for '88 that showed what all the standard and optional features were. For NA cars the trunk lid spoiler, roof spoiler, and the side skirts were all part of an optional "aero package". On SC cars, the "aero package" came standard. Be sure to bring us some commentary on this weekends Auto-x. Some action shots would be great too! Curious to see where the suspension upgrades put you compared to dedicated Me-otters. I realized today that I don't recall ever changing or checking the transmission fluid since I bought the car. Took care of that today with a some fresh gear oil. Man, I just never get used to the stench of the stuff. Nasty smell. Hate it, Hate it, Hate it. I'll have the GoPro running, and hopefully can get some action shots if anybody else can handle the camera work. I'll be too busy and nervous, so I won't be hauling my good Pentax with me. I assume this is your car showing up on OLA's Facebook feed? You're famous! Actually, yes, yes it is! I saw Brock had it on the OLOA Twitter feed myself, I don't currently do facebook in any form. Puts a bit of a spotlight on me for a bit though. I should probably wear some pants. Short version. 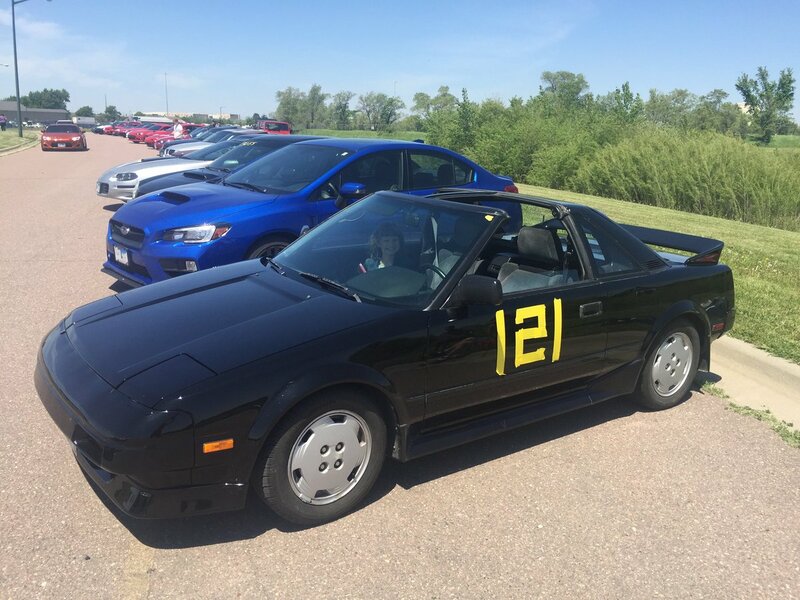 I went autocrossing today. I had two goals. 1. Don't blow up the car. 2. Don't get lost while driving. I can happily report complete success for today. Bonus points for not hitting other cars, and actually running all 6 runs cleanly. Times weren't awesome, but nowhere near the slowest either. Hot times for the course were low 50 seconds, average a hair more than 60 seconds, slowest were 70+. My slowest was a 67, fastest a 62, averaging around 65. For a my first time driving in an event I am very happy with those numbers. Not a single cone crunched. I was particularly worried about the slalom, ended up not being an issue. Car performed different than I expected. I expected oversteer issues. Instead it was understeer, consistent understeer. After the first three runs I softened the back dampeners by two clicks, which reduced but did not eliminate the understeer. I didn't want to mess with it too much though l. I'm too green. May have also been driver induced, too much braking while steering, but I don't believe I was locking the wheels. I'll mount my camera to watch the front wheels next time. Braking? Never had any issues with braking performance. I just don't like the pedal feel. Not spongy, like it needs to be bled, but not as firm as I'd like. Still slows me down as much as I need it to. Never came out wishing for more brakes. Still running generic pads and rotors, and upgrades to those are planned, so not overly concerned. I know I'll need more braking as I speed up, but proper pads should be all I need. The biggest issue I had was powerband. Seemed like every time I just get it into second gear, there's a sharp turn, and I've got to row it back to first to keep the power up. I expect that to go away as my speed increases, and thus my rpm in 2nd stays high enough to keep it as a viable gear. So, again, driver improvement needed. But all that shifting definitely slowed me down further. Only one real criticism of the car, which I knew was going to come up at some point, I think my clutch may have been slipping when hot. Then again, the car has 125,000 on it. May still be the original clutch. It's not acting up during regular driving, just during one of my runs, not all 6. So time to start shopping, but not like I have to drop the transmission tomorrow. But holy crap did my little AW11 attract attention. Ended up with passengers on 3 of my 6 runs, because they always wanted to drive in one. Lots of people coming over to look at it, chat about it, take photos, or just compliment it. Haven't had attention like that since I sold my D90. I don't have any action photos, just a couple when parked, but did run my GoPro in the cabin for my last 3 runs. Gimmie a bit to sort and upload. There was a guy doing photo work, but don't know how to get in touch. Hopefully somebody can get me in contact with him. Forget a bike, I want an electric skateboard. Saw somebody using one for walking the course. Much easier to haul. Community helmets are very stinky and sweaty by the end of the day. And it's all stink and sweat from other people. I need my own. Did you get a chance to ride along with anyone? I always encourage new people to hop in the car with as many people as they can. Autocross, especially fast autocross, is so far outside our range of street driving sensation that a simple recalibration in your head can cut a couple of seconds off your time. And it's not limited to new people either, I picked up a full second by riding with a friend in a similar car and realizing that I could brake WAY later than I was. Riding in stupid fast cars is just plain fun too. Yep, I got 2 rides before my run session, in a very built up rabbit on Hoosiers. That was a huge help in tracking the cones, particularly since he was so much faster. Driving my own car after that I didn't have any time compression issues, and was able to mentally keep ahead of the car. Reviewing my videos is going to be big too, I can already see some areas where I could pick up time. Also see a lot about car setup and how they handle while working the course. Wish I could have watched somebody else drive my car while I was out there working. Not that I'm overly connected to this one yet, but it did cause some scoring issues. Somebody in a black 'vette showed up with 121 already stickered on the side, they assigned him 121a for scoring for the day (he was in line after me to register). Well, I ended up with his times for runs 4-6, where he got listed as DNF's. So ignore my last 3 for the day down in the bottom of TTE, my actual best was the 62.738 .... but that also means I'm not the one that chomped cones on 5 of his 6 runs. Nobody had 104 at all, so I think I'll order me some numbers. Wife said she agreed the community helmets were stinky, and knows I need one to start doing HPDE's. So she told me to pick out a reasonably priced one for an early Father's Day gift. Got my numbers ordered too. More good news, I cannot get it to skip the clutch at all, even intentionally. So unless something happens again in not going to worry about it just yet. cool to see this coming together. hopefully I'll get to see it in the flesh in 2018.
as an fyi, OneLap requires "human powered" sighting transport. powered bikes/boards/barstools are considered an "unfair advantage". best to have your "infrastructure" items acquired and used in the autoX/HPDE as you get ready for OneLap. That way you can figure out what works along the way... will help reduce what you have to pack in the car/trailer. Good to know about having to have 'human powered' transport for the track walks. Maybe I'll re-learn how to ride a long board. I'm also really torn regarding amenities. Despite having power locks, the car doesn't have remote entry, so I need to use the key to get in. I'll be honest, I'm getting lazy and spoiled, but I kinda want keyless entry again. But at the same time, I've been burned too many times by utter garbage aftermarket electronics. Particularly crap alarm systems. I actually REMOVED a cheap keyless entry system from the car when I bought it. But I wouldn't be against a GOOD keyless entry system, installed to MY standard. I just can't find any that don't have the appearance of being bargain priced garbage. Other than cleaning a few things up, such as remote mountings and the new lower strut mounts, I think it's time to start pivoting from stage 1 of this build to stage 2. Stage 1 was essentially suspension and clearing up previous owner nonsense. Sure, there will be occasional tweaks and such, but the major overhaul and upgrade work is done. Stage 2 will be driver safety and rules compliance. Why not the engine? Let's face it ... I'll get more return on my effort right now from improving as a driver. I'm not taking full advantage of the car I already have. 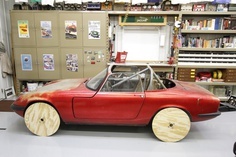 It would be foolish to chase a bunch of car modifications at this point. This doesn't mean I'm not going to slowly do some puttering around on the engine, just that it's not my main focus yet. Though it probably will be over the winter season from 2016-2017. Anyway, so stage 2 is safety and rules compliance. What does that even mean? It's not a huge list, but it's a list. Certain parts of it must be done in order. There will probably be a few more things, though these are the ones I'll be dealing with first. Helmet - I already have a racequip pro15 on order. (Fathers day gift from my Wife). Autocross rules tend to be lenient, but proper track rules are not. No sense in goofing around on a helmet, so I went straight to a SAH2015 closed face as required by most HPDE's. The good thing about this is the 2015's JUST came out, and usually you're good with the two previous standards. So realistically this helmet could be good for up to 15 years. When the budget permits, I'll probably pick up a HANS device or something similar, but that will be a while. For OneLap I'll at least look into renting one. Proper pads and rotors. - Been talking to Scott at Matrix Garage about these already. Probably ordering toward the end of June. I'll be sticking with the EBC yellows and stoptech rotors. The calipers have all been rebuilt and new soft lines installed. Fire extinquisher. - Easy to do, can be done anytime, not a huge issue. Pick one that meets the standard, mount it within reach of the driver, done. Power cutoff - Again, not a difficult thing. Just a matter of picking the location, mounting it, and slapping on a sticker for the track crew. Driver containment and rollover protection. Seats, Harness, Roll Bar(?). For all sorts of reasons I'll be keeping the factory belts in place for street driving, and running a 6pt harness for performance driving. But you can't run a 5pt or 6pt harnesses with the factory seats, so I need to get seats before I get the harness. I want to get a fiberglass shell seat, not a steel tube frame, and still have adjustable rails. Right now I'm leaning toward the Corbeau FX1 pro with the double locking rails. But I'm more than open on seats as long as it meets my requirements. Fiberglass shell, double locking rails, fits the car, plus don't forget I'm on a budget. Oh, and no e-bay knockoffs like the fake Bride's. My big concern in this is seat height. Realistically I'd like to lower the seat about an inch in relation to stock. If I wear a helmet it bumps into the T-tops and OneLap wants me to have the T-tops in place. What do I have to do on a seat to ensure it's HANS compatible too? Decided I didn't like the masking tape numbering, that and 121 apparently ended up on a couple cars that day, so I picked a new number and did it a bit differently for next time.